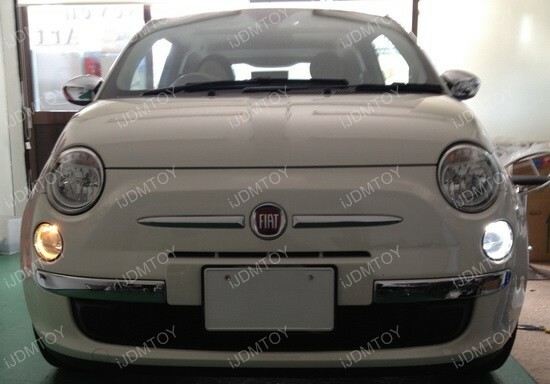 Updates and News about Fiat for cars installed with iJDMTOY LED lights, HID lights and more. The Fiat is quite a head turner, with its unique design and compact stature. The car has gained some popularity in the last few years so the list of compatible aftermarket accessories that do the Fiat justice has exploded. 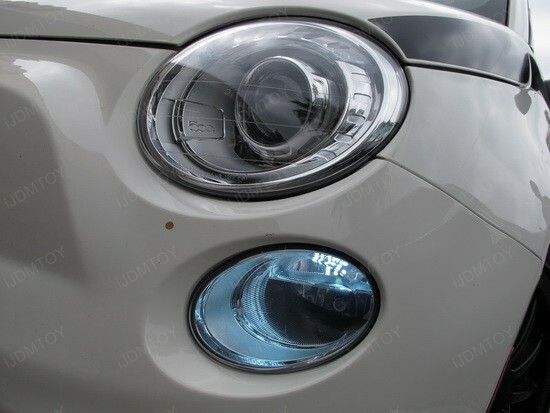 Here is a set of Fiat 500 7443 LED bulbs that can be used as Fiat 500 LED DRL or turn signal lights. The white gives out a spread out beam of light that is quite a sight to see for yourself and everyone else on the road. 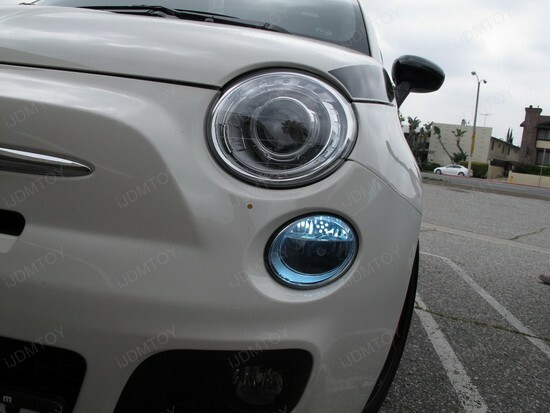 This customer came to our store to try this brand new LED Daytime Running Light Bulbs on his Fiat 500. Each LED Daytime Running Light Bulb has 21-SMD 5050 Single Filament Error Free 7440 LED light, and we tested on 2005 Lexus RX330, 2010 Volkswagen MK6 GTi, etc, there are no error on dashboard and no hyper flashing problem. It is very easy to install these LED DRL lights, just plug and play, if you meet any questions, please feel free to contact us. 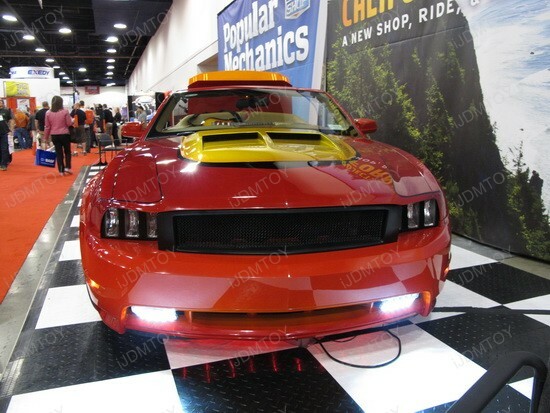 I headed to the Popular Mechanics Booth and was very happy to find a 2011 Ford Mustang with not two, but four LED Daytime Running Lights. 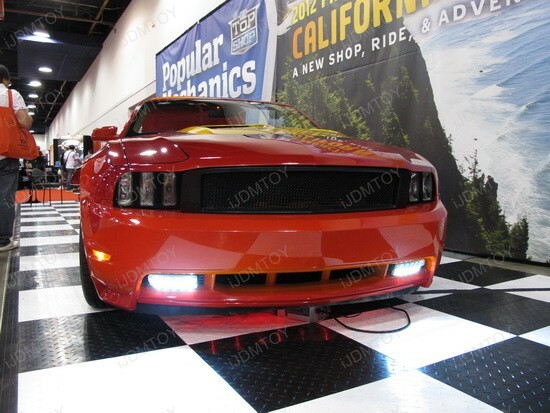 Maybe this is the time to tell you that Ford announced the 2013 ‘Stang and LED technology comes within standard package. Actually, it was about time manufacturers to include LED, but ain’t it great that Popular Mechanics really did something impressive, thinking ahead of time – they took two pairs of Brabus Style 5-LED lamps and turned them into a pair of 10-LED lamps on each side. The result is obvious – the car looks definitely more stylish, lower and wider. Installing the LED Daytime Running Lights in set of two seems to be the right thing to do, just because the openings in the front bumper are bigger for better airflow and thinner DRL lamps just won’t look good. And what’s more, these bad boys could be used as fog lights – the amount of light they produce is enormously bright, which makes them perfect for places with reduced visibility. 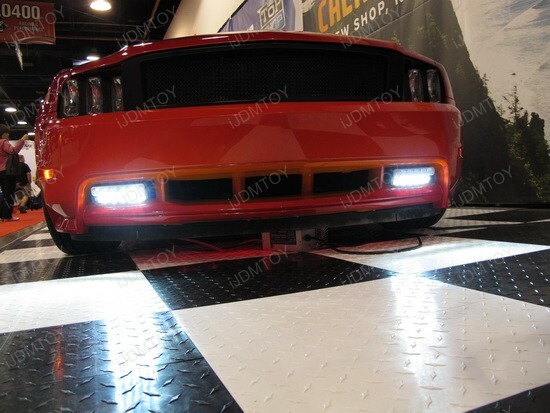 As it turned out, this LED automotive lightning accessory is very popular in this year’s SEMA show cars. I saw it installed on that Fiat 500 at the Chrysler FIAT Booth, and on one more car, that will be unveiled in another report, so stay tuned. 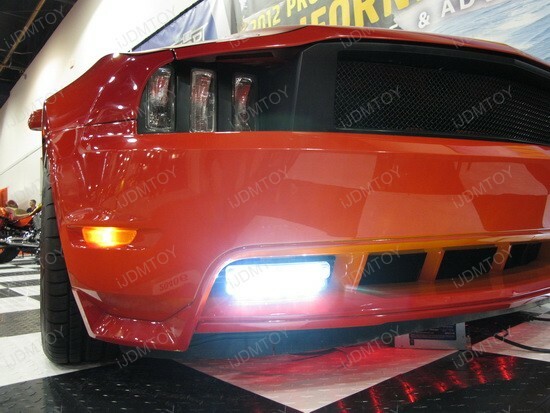 In meantime, take a look at JDM Toys online store and search for Xenon White Euro Mercedes Brabus Style 5-Light LED DRL Kit. This kit includes a set of two 5-LED lamps, which look just like the Mercedes-Benz Brabus Style DRL and can be easily mounted for any cars, SUVs or trucks in between the bumper grill, or below the bumper. 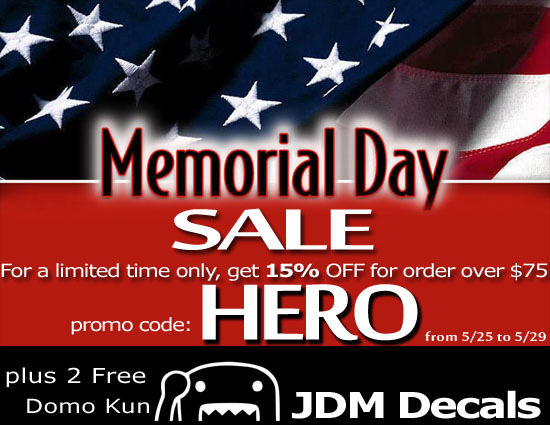 The last time I checked, there was a huge discount, so hurry up! The iconic 2011 Ford Mustang is a real proof for a symbiosis between classic muscle car and new age modern technology. 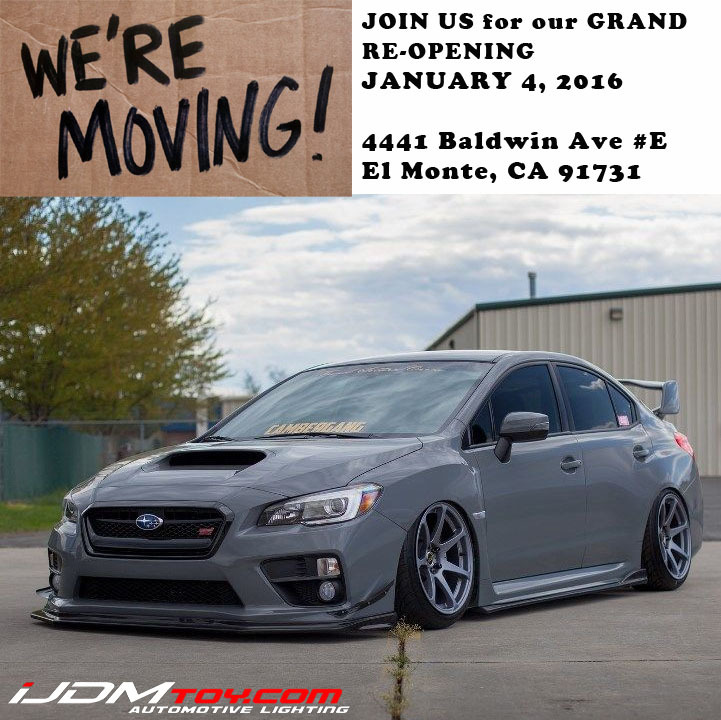 And while waiting for the next SEMA 2011 fancy lightning accessories reports, you can take a good look at the featured LED Daytime Running Lights and consider giving your car a new sleek LED look. 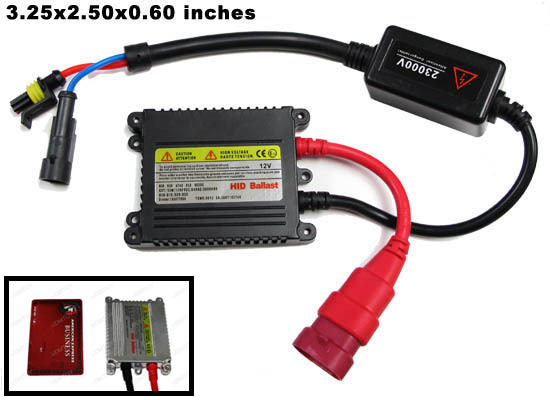 After Thanksgiving Sale – save 20% Off when you order over $100 from November 25-28, 2011 at iJDMTOY.com, the Car LED expert.